The stock 8.1 liter intake manifold was designed for low RPM use and cannot meet the high-RPM air flow demands of the 496 / 8.1 liter engine in performance applications. Our Cool Gap intake manifold has been engineered for one purpose, maximum airflow and power output. We designed the Cool Gap intake manifold for marine or non-emissions applications where stock appearance and emissions connections are not required. 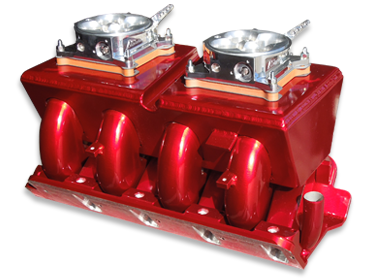 Our intake manifold incorporates long, high velocity runners to provide excellent low and mid-range torque levels and a large plenum volume to satisfy this engine’s demand for more air at higher RPM’s. The Raylar Cool Gap intake manifold adds an additional 30% in air volume over the stock manifold, which means proper breathing at high RPM and big power gains across the power band. The Cool Gap intake manifold gets its name from two air gaps. One between the engine lifter valley and the intake manifold runners and one between the runners and the plenum. Our design keeps the incoming air fuel mixtures cool and dense, producing more power and torque over the entire power band. The Cool Gap intake manifold also features a design that allows it to bolt on in the same space as the stock manifolds, and accepts all standard fittings, sensors, brackets, injectors, fuel rails, and accessories without additional modifications to the engine or its wiring. For street applications not limited by emissions requirements, the Cool Gap manifold fits in the same space as the stock truck manifold. Stock fuel rails bolt right on, however there are no EGR provisions, the stock wiring will require modification and the throttle body is mounted at a different angle. In turbocharged or centrifugal supercharged applications, the Cool Gap intake manifold produces gobs of additional power! The Raylar Cool Gap aluminum intake manifold for the 7th generation big block chevy is engineered to maximize the horsepower and torque levels of the 496 / 8.1 liter vortec engine when used with performance cylinder heads and camshafts. Need more air? We offer several variants of the Cool Gap manifold to meet your engine’s demand. 80MM - 80MM opening (3 bolt / LS1) for ported throttle bodies. 90MM - 90MM opening (4 bolt / LS2) for 90MM throttle bodies. For applications needing even more air our Unlimited Edition which uses dual 1000CFM Holley type electronic throttle bodies. Unlimited Edition - Dual 1000CFM Holley-type electronic throttle bodies mounted tunnel-ram style on top of the plenum. Our Unlimited Edition still uses the stock fuel injection rails and electrical system. For big block 8.1 liter engines not requiring maximum high-RPM airflow, we can modify your stock 496 / 8.1 liter intake manifold. This intake modification will increase airflow to your big block vortec engine while still retaining stock looks and passes emissions. We remove the stock plenum blockages inside the manifold to reduce restriction and free up horsepower and smooth the individual intake runners. Intake manifold modification does not replace the Cool Gap manifold but does offer about 80% as much airflow. Intake manifold modification will show gains throughout the RPM band. We recommend computer tuning for any ported intake manifold for maximum power gains. 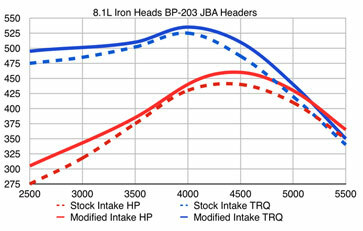 Intake modification is essential if you are considering adding additional cubic inches to your 8.1L engine. 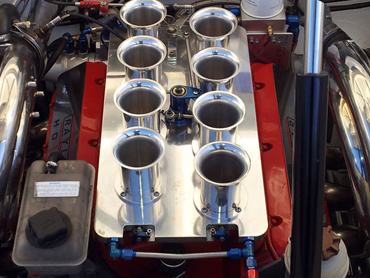 Our billet aluminum EFI stack inection intake manifold is the same induction system we use on the 632cid H0750. It is the perfect fit for maximum performance and style in hot rods, boats and muscle cars. 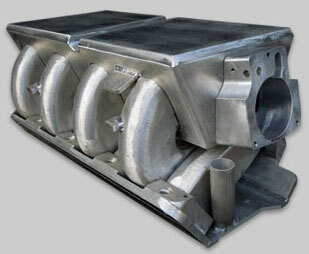 Each of our stack injection manifolds are custom made for your application at the time of order. Please allow 4-6 weeks for delivery. In the image above, you can compare the intake path as the air enters the air bank. The stock manifold opens to an air dam routing air deeper into the manifold, restricting airflow and adding heat. The blue line in the image below shows the airflow into the stock Chevrolet / GM Vortec 8100 8.1L intake manifold. There are three changes in direction before the air has even reached the plenum! The red line in the image to the right shows air as it flows out of the heat soaked core through the curved runners into the engine. The stock intake manifold really chokes the Vortec 8.1L engine back. Our intake manifold modification removes all restriction from the intake system, allowing your engine to breathe properly and produce better power - everywhere in the powerband. Our 80mm throttle body is a quick way to add 15 horsepower. 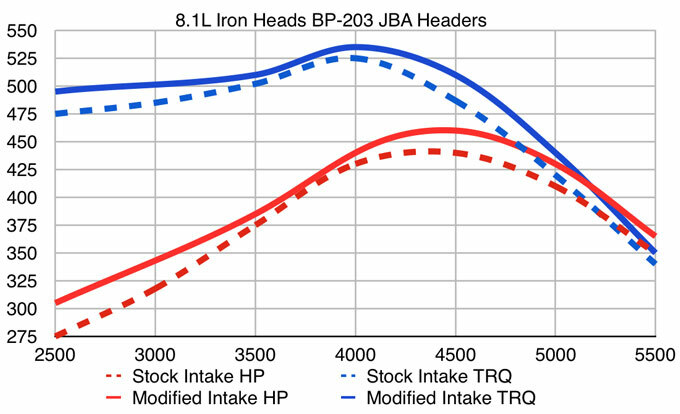 Gains are achieved by smoothing the intake path and increasing the volume of air entering the engine at wide open throttle. Prices subject to change. CA sales tax applies if billing address is in CA.